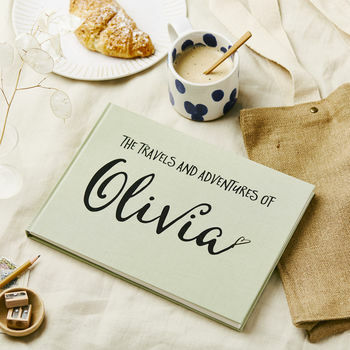 A gorgeous high quality fabric covered book perfect for memories of a special trip. Can be personalised with any text along the name. Available in three colours - grey, sand and sage. Hardcover with plain paper inside. These are handbound in England and printed digitally from our studio in Wales. A4 size (30cm x 21cm).